The 10 Best Bagel Shops in Oregon! In case you were thinking that perfect bagels could only be found on the East Coast, the Oregon culinary scene has bagels down pat. The state’s bagel shops will satisfy, whether you’re hungry for a lox bagel or one topped with wildflower honey. Here are the 10 best bagel shops in Oregon! Boiled in an iron kettle and baked in a stone hearth, Bagel Sphere bagels is what traditionalists turn to when they want the real thing. They get their flavor the old-fashioned way—through proper fermentation procedures that take time rather than trying to rush the process by using flavor additives. They’re so popular in Eugene that they’ve got two locations. 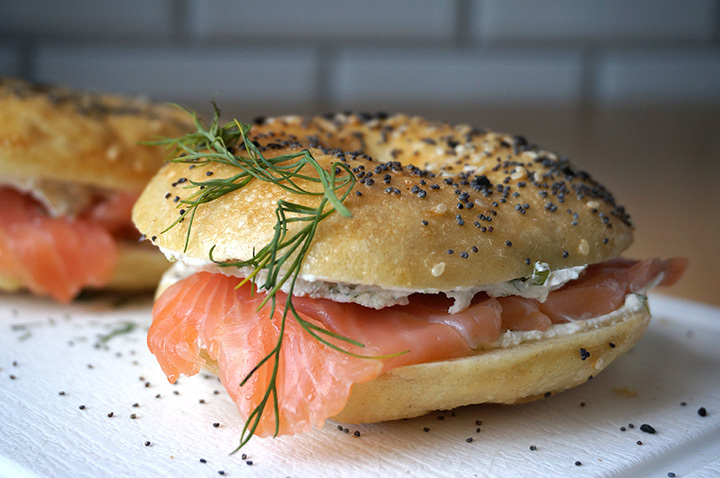 Looking for New York City style kosher bagels? Look no farther than Bowery Bagels in Portland. You don’t even have to make the trek yourself to satisfy your bagel craving— Bowery Bagels has partnered with Portland Pedal Power to have your favorite bagel sandwiches and other tasty menu items delivered to the location of your choice for breakfast or lunch. Only the best possible ingredients are used in the production of these classic boiled bagels. Everything is made in-house from scratch. Don’t miss this place if you’re serious about traditionally crafted bagels. A quintessential neighborhood bagel shop, Einstein Bros. is where Hillsboro residents gather for freshly baked bagels, good coffee, and pleasant conversation with their friends and neighbors. Einstein Bros. does catering, too, so keep them in mind when you want your next gathering to feature great food and beverages. Don’t let anyone tell you Southern Oregon doesn’t do bagels right. The Daily Bagel in Klamath Falls offers freshly baked bagels every morning as well as creative breakfast and lunch fare throughout the day. You can count on The Daily Bagel for the best homemade soups in town. Big O is where Bendites go to get their bagels, coffee, and other breakfast and lunch goodies. The food is fresh, and the service is fast and friendly. If you’re looking for take-home bagels at budget prices, ask them about their day-old specials. Tastebud Bagels are a unique combination of classic Montreal-style bagel baking techniques and pure Pacific Northwest water and locally grown wheat. Montreal style bagels may be smaller and denser than what you’re used to, but you try them, you’ll be a convert for life. Kenny & Zukes is a truly authentic Jewish delicatessen that could easily have been picked up in New York City and put down in Portland’s Hawthorne District. Kenny & Zukes recently opened Bagelworks, where bagels are hand-rolled before being boiled in sugar and malt. Kenny & Zukes takes no shortcuts when it comes to bagel production. The dough is proofed for 36 hours prior to being boiled and baked in a steam oven in small batches. Favorite of local parents and grandparents, Sunrise Bagels features a variety of flavored bagels to keep the kids happy while adults enjoy more traditional fare such as plain bagels topped with lox and creamed cheese. Or try one of their expertly crafted poppy seed bagels with a combination of creamed cheese and locally sourced wildflower honey. Organic ingredients and friendly service with a smile are waiting for you at Ashland’s Little Shop of Bagels. Those who like it hot should try the jalapeño bagels with pepper jack creamed cheese.